1. To deny Egypt as the origin of the alphabet. 2. To place a European country as the source of real alphabets with “vowels”. i. The Erroneously-called “Hieratic” Script is claimed, by Western academians, to be a unique form of cursive writing of the Egyptian Language. It is further claimed by Western academians that this “unique” style was used extensively by the priests for literary or religious texts as well as for business and personal documents. This is absolutely false and misleading, for “hieratic” means sacred/religious, and it is an oxymoron to call a script “hieratic” which has no sacred/religious mundane purpose! Western academia has categorized Egyptian writings of the most mundane nature as being “hieratic”; such as those found on bits of pottery and stone called ostraka, as well as labels on vessels!! Yet, there is nothing sacred/hieratic about labels on bottles! – Work records, working memorandum, inspection reports. – Lists of workmen, rations, and supplies. – A record of a visitor to the construction site. – The roster of a quarrying expedition. – Daily records of work done. – Notes of visits of inspection by scribes and superiors. – Rosters of the skilled and unskilled workmen employed on a construction site. ii. Enchorial/Demotic Script is claimed by Western academians to be a unique form of cursive writing of the Egyptian Language. It is further claimed by Western academies that this “unique” style was used for everyday affairs, for the Ancient Egyptians. It is claimed by Western academians that it was kind of a very cursive shorthand for rapid writing which was replete with ligatures, abbreviations and other orthographic peculiarities. As such, these academies claim that the demotic record is dominated by legal, administrative, and commercial material, literary compositions, scientific and even “religious texts” which were written in a more calligraphic hand. If academies claim that this script was used for “religious texts” as well as business documents, how is it possible to call this rapid cursive form “Demotic” when it was used for Hieratic/sacred purposes in religious writing?! iii. Coptic Script is claimed by Western academians to be a unique form of cursive writing of the Egyptian Language. 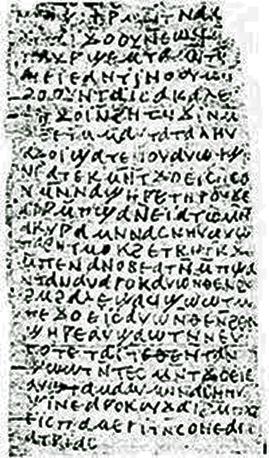 It is further stated by Western academies by sheer repetition (and contrary to facts), that a “Coptic” form of writing was developed about 300 CE for the use of the Christian population in Egypt which consisted of the letters of the Greek alphabet with an additional six characters (derived from the Ancient Egyptian demotic script) to express sounds that were peculiar to the Egyptian language!Shown below is “Coptic script” from the Nag Hammadi Codices . It is written in uncials and has the same exact Ancient Egyptian letter-forms thousands of years before the Greek era. The so-called “Coptic”/“Greek” script is in fact an Ancient Egyptian uncials form of writing. It was the Greeks who adopted them from the Egyptians, when they came to Egypt as mercenaries or to study, and not the reverse. In the 17th century, Father Athanasius Kircher has acknowledged, in his extensive analytical works, that the “Greek” script is Ancient Egyptian in origin. And for that, he was badly ridiculed by his fellow Europeans. 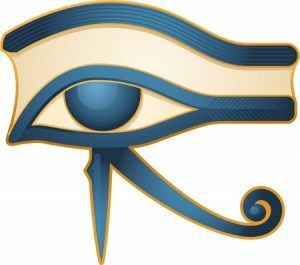 The third item, being the Egyptian Hieroglyphics and its nature, meanings, etc., was discussed earlier. Clement never stated that the Egyptian “hieratic” style was a “cursive” or “degenerated” form of hieroglyph­ics. Hieroglyphics was notably the very last form that he mentioned. 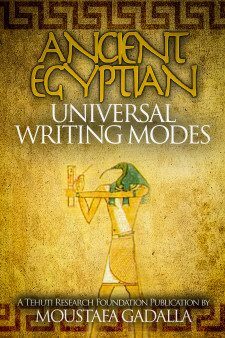 The last mode of script being hieroglyphics is NOT of letters and words, but Clement re-affirmed what ALL writers of antiquities had indicated: that Egyptian hieroglyphics are of three natures—imitative, figurative and allegorical. So Clement of Alexandria specifies two primary alphabetic writing modes—one for domestic/common/public use and another that is performed exclusively by the Egyptian priests and used exclusively for religious writings. This was a more careful application used for legal, professional [scientific and medical], and governmental documents. These were carefully executed by specialized and highly qualified scribes according to standards set in each of such applications, which are identified as specific calligraphic forms [to be discussed later in this chapter]. As in all Egyptian cursive writing, it was ligatured/not ligatured according to a specific system, as discussed earlier. As such, it shows that some letters have different forms when used as the first letter in a word (initial) than when used elsewhere in the word (medial, final). Shown above is a sample of the erroneously-labeled (by Western academia) “hieratic” style as it appears in the Ebers Papyrus, which looks exactly like the erroneously-labeled (by western academia) “Demotic script! Scripts that are not intended to be of public records but for business and everyday affairs were not confined to any set standard [calligraphic] form(s) and were not executed by official scribes. Such category of scripts/documents/writings extended to private letters. As in all Egyptian cursive writing, it was ligatured/not ligatured according to a specific system, as discussed earlier. As such, it shows that some letters have different forms when used as the first letter in a word (initial) than when used elsewhere in the word (medial, final).. Since such scripts were done by non-professional scribes, there were differences – often minor but still evident – in script, vocabulary, morphology, and/or syntax; as one would expect the same with modern handwriting. As was common with this type of uncontrolled writing category, there was frequent use of abbreviations, especially with words that are used frequently. In their sacred writings, the Ancient Egyptian priests [as confirmed in Clement’s statement above] used Uncials—the unconnected non-cursive form of alphabetic letters. As stated in an earlier chapter, each alphabetic letter in the Ancient Egyptian language [which was copied in later “Arabic”] has four forms—the first of which is the uncial letter-form. Despite all the academic noise/assertions, there is NOT a single Egyptian religious text written in what they erroneously labeled “Hieratic” script, which is a cursive and not uncials writing. Western academia renamed the REAL uncial script that the Ancient Egyptians used for religious purposes as “Coptic”, which they declared to be “an Egyptian adoption of Greek alphabet with some additional letters from demotic”! There is not a single historical record to confirm their fabricated assertions.